Despite being a huge fan of death-thrash, I wind up feeling and sounding more like a curmudgeonly Goldilocks when I write about the stuff. It’s not fast enough, it’s not thrashy enough, it’s not death-y enough, there aren’t enough of those devastating Slayer-style slowdowns, and on and on ad infinitum. Naturally, I began to worry: was it me? Have I outgrown death-thrash? Was I, in some extremely unlikely scenario, wrong about a bunch of stuff? Then I happened upon Germany’s Slaughterer, and the answers revealed themselves: nope, nope, and nope. Slaughterer first came into my rotation when their excellent debut, Possessing Violence, popped up during a long trawl for new music. A potent mixture of Morbid Saint, Merciless, and Massacra but not entirely derivative of any of them, Possessing Violence quickly became a record I couldn’t stop spinning. 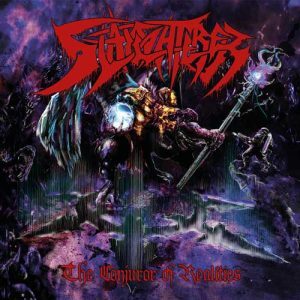 Slaughterer clearly lived and breathed death-thrash, and sought not to emulate their influences but rather to dethrone them; in other words, this was a downright hungry band. Fortunately, absolutely nothing, minus a bit more polish in production and playing, has changed on their sophomore release The Conjurer of Realities. What’s fascinating about The Conjurer of Realities is how close it comes to its goal of completely annihilating its decades-old competition forever entrenched in the hallowed halls of death-thrash. This is the most sincere set of songs I’ve heard all year, as they’re less composed than unleashed; there’s no overthinking present as riff after tremendous, top-tier riff assaults the ears. Opener “Blasphemer” is easily the best death-thrash song of the last five years if not decade, expertly exploiting a deceptively simple structure to hammer its ideas home and explore them to their fullest extent and not one iota beyond. “Corpse Devourer” has the best death-thrash tempo drop since Morbid Saint’s immortal “Scars,” and the only reason the latter may be slightly better is due to Spectrum of Death’s indisputable legendary status, not any deficiency on Slaughterer’s part. The lack of pretension, emulation, or mere revisions of the theme in Slaughterer’s music is of the utmost importance to Conjurer’s success. The production is bass-heavy, loud, and clear but still thoroughly organic, which is exactly what this music needs to be not just enjoyed but understood. But what is to be understood here? Each song is immediate yet lasting, inspiring almost incessant repeat listening to grasp just how each part forms the greater whole. Transitions are uniformly flawless; each riff is great individually but far better within the structure Slaughterer allows them to thrive in, and the vocals, a brilliant synthesis of early death and more extreme thrash, ebb and flow over top in a way that sounds more instinctual than planned. This spirit of instinct over planning pervades the entirety of The Conjurer of Realities; nobody can pilfer from Slaughterer effectively because to do so one needs the instincts, skills, and understanding of death-thrash peculiar to Slaughterer. The only way to beat Slaughterer at the death-thrash game in the New Year is to be Slaughterer. Without further belabouring the point, Slaughterer’s enthusiasm is so palpable, their ferocity so earnest, and their sequencing so perfect that The Conjurer of Realities has no destiny other than being a genre classic.